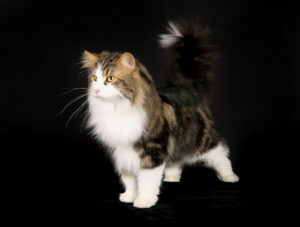 The history of the Norwegian Forest Cat is by far one of the most interesting among the many breeds. The “Wegie” (as it is affectionately known) is an increasingly popular breed with US and UK cat fanciers, however this was not the case until fairly recently. Their true origins are somewhat a mystery–they have come close to extinction at least once in the last 100 years, and have had an amazing journey from their roots in the forested tundras of Norway to homes across the globe in every imaginable climate. The furry nature of this breed is a testament to it’s homeland of Norway, with it’s thick double coat allowing it to live in the very coldest of climates. It’s ancestry is said to include the short haired white cats that were brought from Scandinavia to the UK by the Vikings at the turn of the first millennium. It’s speculated now that these cats were likely used as rat catchers aboard the ships Vikings used to conduct their raids of the English and Scottish coastlines. These cats may have bred with an array of local long haired feral and domesticated cats, with their offspring returning to Norway. Some researchers also believe that Wegies may be linked with breeds from as far away as Turkey and Siberia, so it’s true origins are foggy. Most likely it is a combination of a few, or all, of these breeds evolving over centuries into the Norwegian Forest Cat as we know it today. The Wegie first came into prominence just before the start of World War II in 1938, when the Norwegian Forest Cat Club was initially formed in Oslo, Norway. The war resulted in the small group losing it’s ability to keep track of the breed, leading many to mate with other domesticated cats. This caused the breed to nearly go extinct during the years following the war. Fortunately, the club was able to create an official breeding program in order to keep it alive. Breeding efforts remained exclusively in Norway until the late 1970s, when it finally began to find it’s way into cat fancy registrations across Europe. By 1994 the breed was finally recognized and registered in the U.S., where it has become increasingly popular. 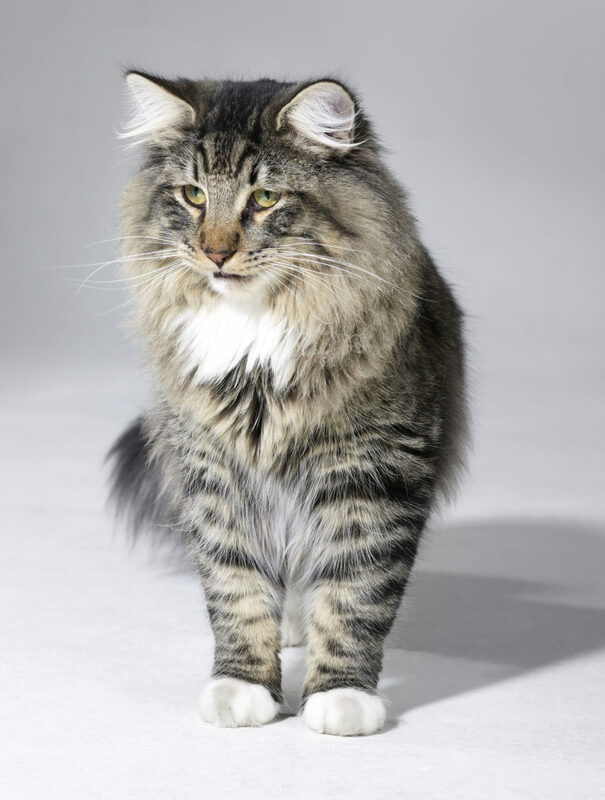 Widespread ownership rates and interest in this beautiful, intelligent and loving cat over the last 70 years–particularly in Norway, Sweden and France–has led the Norwegian Forest Cat from the brink of extinction to a thriving international population today!